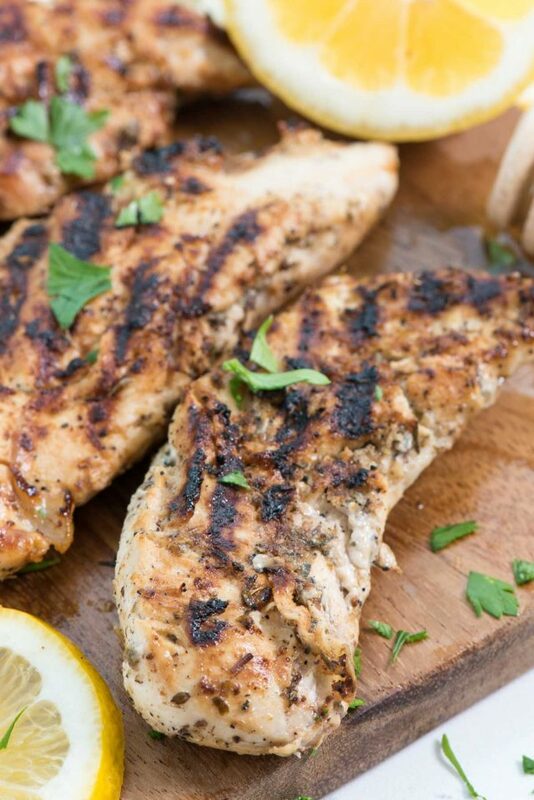 Grilled Lemon Herb Chicken – this delicious and easy chicken marinade recipe is perfect for dinner and is only a 30 minute meal. Winner winner, chicken dinner! If you’re trying out Weight Watchers, this healthy lemon chicken recipe is only 2 points per serving on Freestyle. That saves lots of points for side dishes! Happy New Year my friends! I hope you had a wonderful and safe new year. If you’ve been reading this blog long enough, you’ll know that I don’t really make resolutions because I’m not good at keeping resolutions. Instead, I prefer to set an intention by choosing a word. This year, my word is ME. 2015-2018 were great years for me in business, but they’ve been difficult in real life. I feel that circumstances out of my control have pushed ME to the back burner; I’ve spent a lot of time and energy focusing on other things and people lately and I need to turn some attention back on myself. I need to find my organizational skills so that I can run an efficient business. I need to find my love of my work again. I need to say NO when I get asked to do things I don’t want to do instead of saying yes because it’s easier or nicer. And, of course, I need to concentrate on ME enough that I can focus on eating more healthy foods so that I can lose weight. I have quite a bit of extra weight to lose; the last few years have been hard on me emotionally. When I get emotional, I eat. As I enter my 40s, the weight is collecting in places that are dangerous for my health (my stomach) and it’s also harder to lose. I need to focus and make life changes that will, in turn, make me a happier person. I need to focus on ME so that I can be the person I want to be. If you’re trying to do the healthy thing this year too (I swear, it’s going to stick this time!) then easy meals are something you’re going to need. 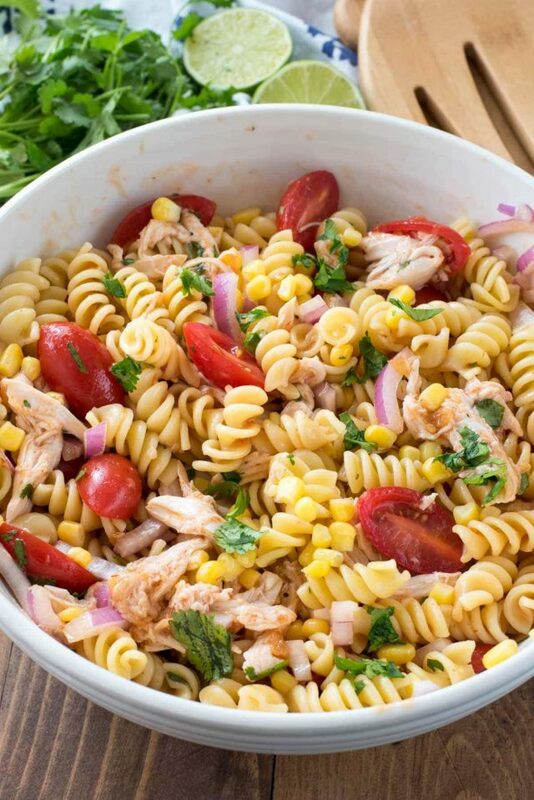 Easy 30-minute meals that are healthy and flavorful are the backbone of eating right! This Lemon Herb Chicken recipe I make all the time. The marinade adds a delicious flavor to the chicken, which cooks great on the grill indoors or out. We make this all year long, using my indoor grill pan in the winter months. I love adding it to salad or pasta and it’s great for lunch or dinner and ready in under 30 minutes! Lemon Herb Chicken is a healthy easy chicken recipe that pairs with any side dish, is great for lunch or dinner, and is done in under 30 minutes! The marinade for this chicken is simple and quick with just a few ingredients. Lemon adds such a brightness to chicken and I love the combination of Italian seasonings mixed with the citrus. Because of the citrus, this is a quick marinade and the entire thing can be done in under 30 minutes. At only 2 WW points per serving, you can eat your heart out! Choose your favorite cut of chicken. 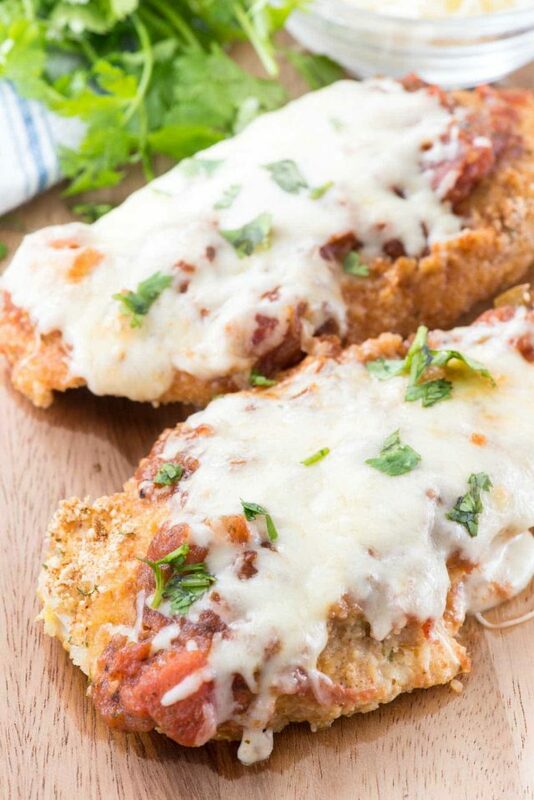 We typically stick to boneless, skinless chicken breasts or chicken breast tenders. I love tenders when I’m trying to cook fast because they grill up super quick. If you don’t have Italian seasoning, make your own mix by adding equal parts of dried thyme, parsley, basil, oregano, and rosemary. Or, use any herbs you like. I’ve also done this with fresh chopped rosemary from my garden as well as just thyme. 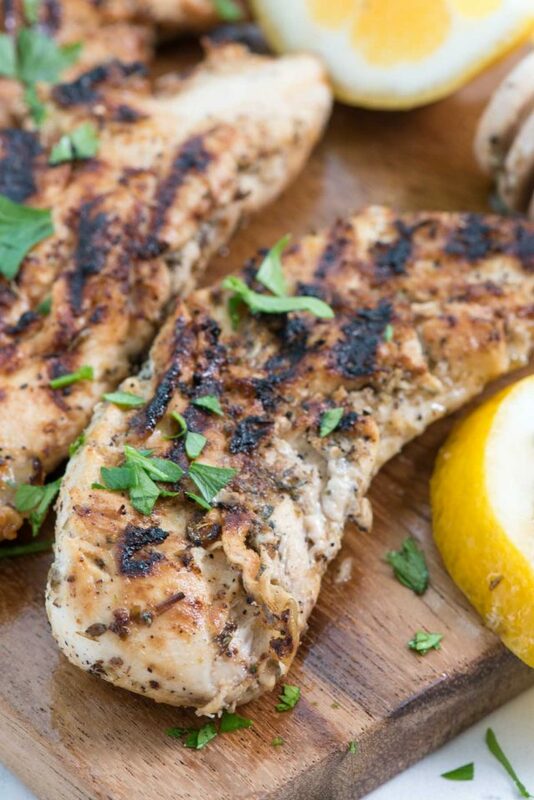 Lemon thyme chicken is another favorite recipe. I love to grill this chicken. Grilled chicken, in my opinion, is the best chicken. In summer we cook on the outdoor grill, but in winter I use an indoor grill like this one. You can also bake or broil this chicken. Bake it at 350°F or broil on high, turning once, until it’s cooked through. Serving suggestions: my favorite way to serve this chicken is on top a big green salad or in a pasta salad. But it’s also great with a simple steamed veggie side dish with rice or potatoes or anything you like. 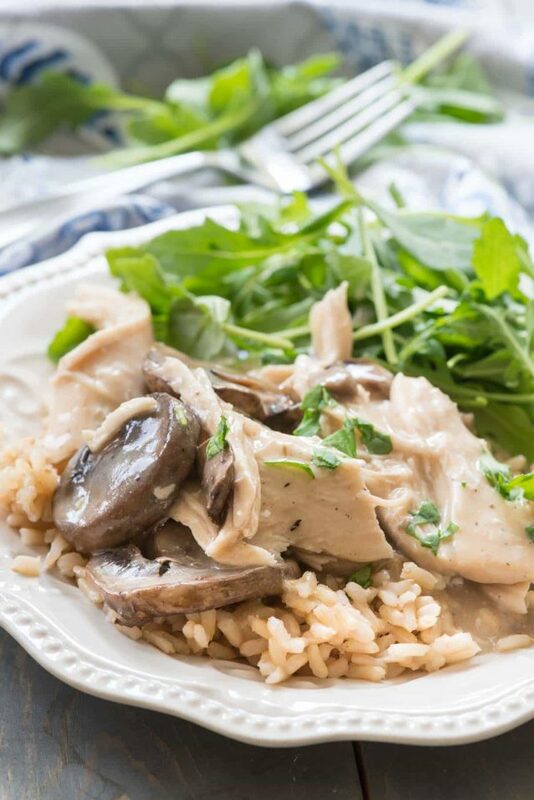 If there is one thing you need to know about this chicken it’s that you need to expect it to become your new best friend and go-to dinner recipe! 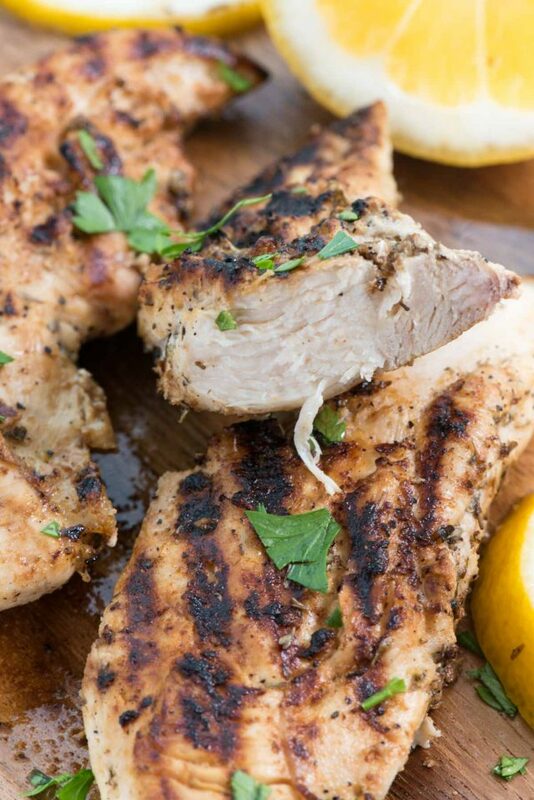 Grilled Lemon Herb Chicken - this delicious and easy chicken marinade recipe is perfect for dinner and is only a 30 minute meal! Whisk together lemon juice, garlic, onion powder, oil, salt, pepper, and seasoning. If you’re using chicken breasts, pound lightly with a rolling pin to make them even in size. Place marinade on chicken. Let soak for 15-30 minutes. Preheat grill or griddle to medium-high heat. Lightly oil grill and grill chicken on both sides until done in the middle. Serve warm or room temperature. This chicken goes great on salad! Dorothy, thanks for the super recipe. I am a lifetime Weight Watcher and have been successful at losing and keeping the weight off. I was a little skeptical of the new Freestyle, but I am liking it. I am eating a lot more eggs and protein in general, which I think is the exact reason for WW changing their program. I am a carb queen, so I was worried that the points for all my favorite foods would be so high I wouldn’t be able to fit them in, but in all honesty, it is just the opposite. I don’t have as much of a craving for them now that I am satisfied and not hungry. I still have my small bowl of cereal each morning (which I love), but instead of having toast with it, I have two hard boiled eggs. I am truly not overly hungry all morning and can make it until lunch without a snack. So many of the foods I am now eating have zero points, so when I do want a “treat” or a carb, I most of the time have the extra points to splurge. Good luck with your journey – the program works, believe me. As always, you are so real and honest and that is what people love to hear. I am so proud of you for making this year about YOU! You are the giver of all givers; you go to the ends of the earth for everyone and I am glad to hear you are reclaiming things back for you. I just did a sponsored social post for WW Freestyle and it seems wonderful! What a brilliant recipe! I love lemon-infused recipes in the winter because they add a bite (and bit) of sunshine to my day. Now that I’m in Philadelphia that’s necessary – it’s COOOLLLLD here! I am so excited that you will be posting WW recipes. I joined WW years ago and lost weight and it has steadily crept up as I fell off the wagon. My daughter and I are working on reducing our portion sizes and trying to make healthy food choices. I read a lot of food blogs and am trying to skip over the dessert posts to avoid temptation. Love reading your blog and now I have one more reason to follow you on Instagram. Hi Dorothy, I have been following you for a while now and just wanted to wish you success as you begin this journey to take care of yourself. I started an exercise program almost a year ago to increase my strength and endurance. They hour I take for the class at my gym is just for me-no phone and no tending to the needs of others. I think of this on the days I really rather go from work to home versus work to the gym. I also feel like I am showing my children that they need to have a balanced life. Recipe pinned! Best of luck! This was delish! Love the lemon in the marinade, chicken turned out juicy and flavorful. I can relate to wanting and needing to lose weight. You got this Dorothy! This recipe looks delicious. I will have to make it. What a fantastic and delicious receipe. I love grilled chicken.